Q. (to Mayor Byrne): What is your favorite John Travolta movie? Q. Mayor Byrne… would you like to dance with John Travolta? After the City Hall ceremonies, Travolta and Allen went back to the Park Hyatt Hotel to face TV and press interviews with a corps of visiting entertainment reporters who had been flown in from all over the Midwest. Reporters were briefed that Travolta desired “news questions,” another way of saying the very private star did not desire personal questions. It turned out to be an impossible request to honor. For example… how could a hard-digging entertainment reporter resist asking for Travolta's version of the famous date he had two weeks ago with 16-year-old Brooke Shields? The wire services reported that Brooke's angry mother had gone looking for them after Brooke still wasn't home at 3 a.m. But Brooke's version was different. Travolta agreed the whole incident grew out of a big misunderstanding, after Brooke's mother actually requested him to take Brooke to his hotel so they could avoid the hordes of devouring paparazzi encamped outside the Shields home. Conclusion: Either the Travolta-Shields date was the most uneventful social occasion of the year, or they spent the whole evening matching up their stories. There is something about Travolta, though, that makes you tend to believe whatever he says about things like the Brooke affair. At 27, the star of the two most successful musicals in history (“Grease” and “Saturday Night Fever”) is an enormously likable man whose face lights up when he smiles. Travolta hates to do interviews, but made the publicity trip to Chicago because (a) he thinks “Blow Out” is a good film, and (b) he is loyal to the film's director, suspense specialist Brian de Palma, who gave Travolta his first substantial theatrical film role in "Carrie" (1976). His co-star, Nancy Allen, made the trip because (a) she also likes the film, and (b) she is married to De Palma, who also starred her in last year's “Dressed to Kill." “Blow Out”'s inspiration seems to come about equally from several real-life assassinations and cover-ups, and from “Blow Up," the 1966 film by Michelangelo Antonioni, in which a photographer obsessively scrutinizes pictures that either do or do not reveal a dead body. The film's ingredients are like a roman a clef of American political intrigue, featuring a gunshot from a grassy knoll, a Zapruder-type assassination film, a Watergate-style dirty trickster, and an automobile plunging off a bridge and trapping a politician and a young girl inside. 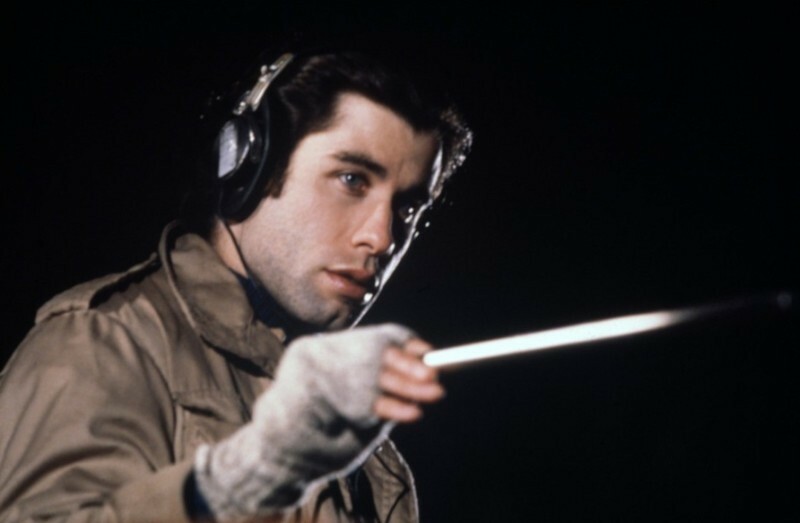 In the movie, Travolta plays a sound re cording engineer for a fly-by-night Philadelphia horror film factory (possibly inspired by George [“Night of the Living Dead”] Romero's operation in Pittsburgh). One night while he's outdoors recording hoot owls for his new sound track, he records the sounds of the death car plunging into the water. He dives in and saves Nancy Allen, who is trapped inside. Later, listening to his tapes, he becomes convinced he can hear a gunshot just before the sound of a tire blowing out. That sound begins to enmesh him in a conspiracy that ranges from the White House to skid row, and from a dirty trickster to a Jack Ruby-type sleaze merchant who specializes in photos of adulterous husbands in compromising positions. “Let's do a demonstration,” Nancy Allen said. “The scene where I surprise you without your makeup on,” Travolta said. They faced each other on the couch. Travolta (suggestively): I didn't realize how pretty you were without all of that makeup. Allen (offended): Hey… who ARE you? She recoiled from Travolta as from an obnoxious stranger. “Now this is the other way,” she said. Travolta (shyly): I didn't realize how pretty you were without all of that makeup. Allen (flattered): Gee, but I look like a mess. When Brian de Palma shot “The Fury” here, I said, he got the look of Chicago better than anyone before or since.